I'm pleased to bring you an interview with Jackie White, owner of the Tir Na n-Og Irish dancing School, Belfast. Tir Na n-Og dancers dance in the Festival style. Christy Dorrity: Tell me about Festival dancing. How is it different from other forms of Irish dance? What are the goals of your dance school? 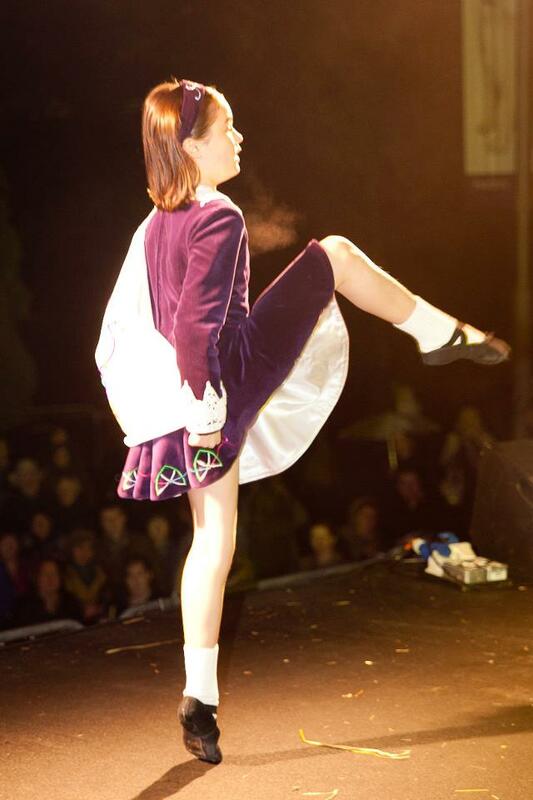 Jackie White: I founded The Tir Na n-Og Irish Dancing School in February of 1998, along with my sister, Bronagh. We concentrate on celebrating the individuality of each child through development of style and technical ability. We are a small, friendly, school with very high standards, both competitively and in our performance work. We choreograph all of our own steps and have many champion dancers both locally and nationally. 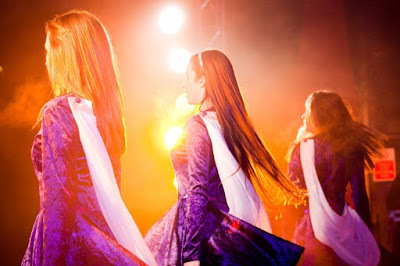 We are an Irish Festival dancing school, and as such, do not wear wigs. The use of fake tan and make up in young children is not permitted. In addition to our competitive work, we have a skilled performance troupe who perform regularly at many events. Read more about the Festival style of dancing here. Christy Dorrity: I've noticed that your dancer's appearances are very different than other Irish dance organizations'. Can you tell me what is different and why? Jackie White: All of our female dancers wear soft velvet costumes with traditional Celtic embroidery. The softness of the full circle skirts reflect the movement and style of our dance, which is elegant and free flowing. We do not wear wigs or tiaras nor is makeup or fake tan permitted amongst our younger dancers. In fact, most of the competitions we take part in stipulate this as a rule on their syllabus. We try hard to celebrate individuality of appearance, and whilst we will ensure some standardization when performing as a team, we encourage dancers to celebrate their individuality in presentation at Festivals. Christy Dorrity: Where have your dancers competed/performed? Christy Dorrity: What's your favorite part of teaching Irish dance? Jackie White: My favourite part of teaching is a dancer’s journey from a tiny child through to a senior dancer. We try to get every dancer to be the best that they can be. For some that is many times a senior champion, and for others it is to simply enjoy their classes and stay fit and healthy. Christy Dorrity: What plans do you have for the future of your dance school? How does the future look for Festival dancing? Jackie White: We plan to continue teaching with high standards in our school. We are extremely proud of what we have achieved, and want to build on that ,as much talent exists in our younger school, so it will be nice to see how that unfolds in the coming years. I think the future looks extremely bright in Festival dancing, as many in the Irish Dance world learn of its existence and are struck by its beauty and tradition. We currently have a Festival dancer (Lauren Smyth) as a lead in Riverdance. Lauren demonstrates how our art form translates particularly well to performance work. Anyone wishing to find out more about Tir Na n-Og Irish Dancing School should visit the website www.tirnanogschool.weebly.com, or contact Jackie White at jackiewhite31@hotmail.com. 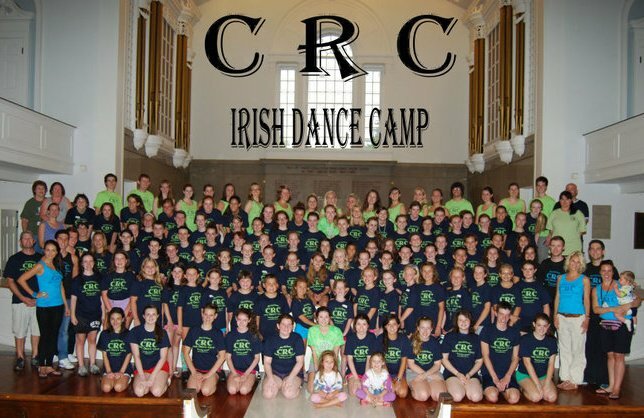 For more than fifteen years, Camp Rince Ceol has been known as the camp “where Irish dancers spend their summers.” Two years ago, young adults, ages 19-24, were given a chance to experience the highly acclaimed Irish dance camp. And recently, the camp opened it's doors to adults of all ages. After receiving many requests to allow older dancers to attend camp, Sheila and Tony decided to invite dancers ages 19-24 to attend Camp Rince Ceol. For the past two seasons, young adults have been able to participate in the training and fun. Now, for the first time, adults of all ages will come together to increase their learning of Irish dance and culture. Adult dancers receive all of the benefits of their younger counterparts: a full curriculum of core classes (including TCRG training classes), bonus classes, amazing meals, clean rooms (no tents here), night-time activities, and an opportunity to showcase what they have learned. In addition to the regular privileges, adults get a few extra perks. Housing will be provided on campus in a sorority house, where adults will be able to socialize and help each other practice during their down time, if they choose. Adults are allowed the use of cell phones, have access to a Wi-Fi network during camp, and are treated to an off-campus dinner with instructors. The adult camp and the camp for children will be kept separate from each other. 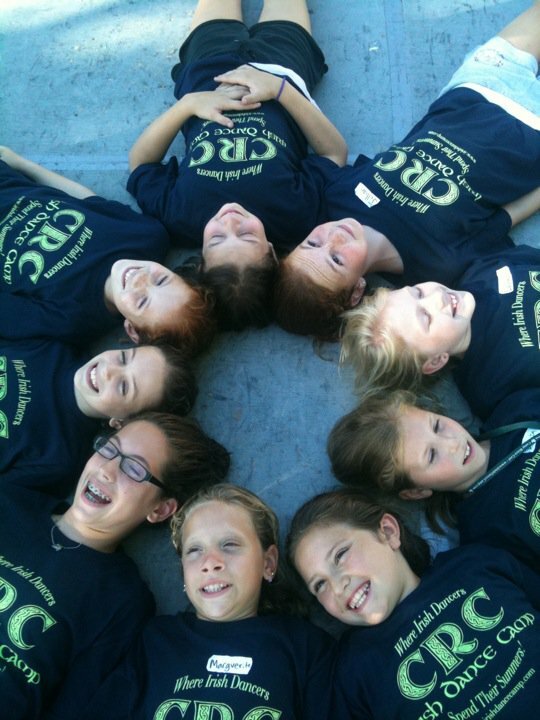 Sheila wants Irish dancers to have a great experience socializing, having fun and sharing the love of Irish dance. Sheila says, “Camp is fun, but we are there for a reason—the kids work hard." Sheila says that the adults work just as hard as the kids do. "We want adults to have the same opportunities as the kids." Camp Rince Ceol is open to campers ages 8 and up. Camp Rince Ceol has been approved by An Coimisiun le Rinci Gaelacha as an "Open Workshop" for 2015 and therefore is exempt from any association/affiliation rules. 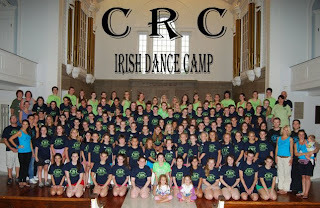 Camp Rince Ceol is open to all CLRG dancers. Dancers (including adults) from other organizations are welcome to attend the open platform camp that runs simultaneously with the adult course week. 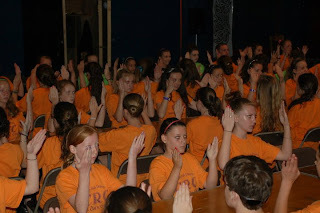 Adults are invited to attend Camp Rince Ceol in New York during the week of July 5th through the 10th. My cute kiddos and I! 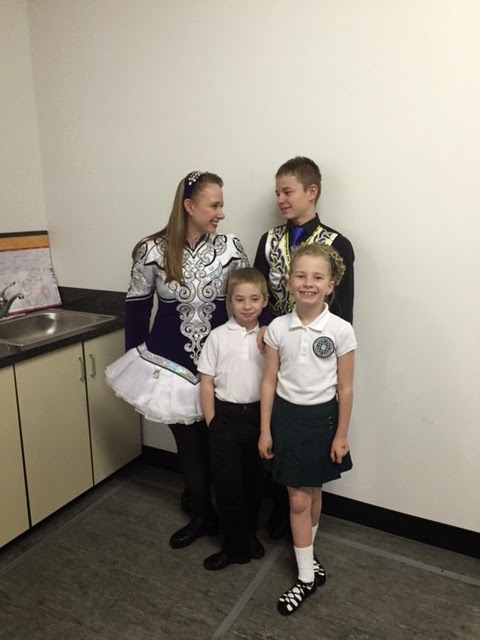 Mothers and fathers who have children in Irish dance, and are dancers themselves, know of the joys that come from sharing Irish dance together. Can that be a typo? How could anyone think that including more children in dance would ever be less expensive? Families who have many children understand how hectic life can be when each child is going in a different direction--soccer on Tuesday, dance on Wednesday, piano on Thursday, and so on. When a majority of the family does the same activity, there is less running around and juggling of schedules. Many dance schools offer family discounts and most feiseanna have a family maximum on fees. Expensive shoes and costumes can be passed down to younger siblings. Melissa Cleverly, an adult dancer, and mother of dancers in Utah says, "I just put shoes that are too small in a bin, and when a younger sibling needs a pair of shoes we go to the shoe bin to get pair of shoes." Not only do parents and children enjoy one another's company at practices and performance, but even the travel time can be a perfect opportunity for sharing and quality heart-to-hearts. Many families turn competition weekends into vacations, or family vacations into competition weekends. Rachel Joy, adult Irish dancer from Beaton School of Irish Dance in Maryland, says, "Driving to and from feiseanna is the best time; parent/child competitions are fun too!" Performing together in recitals or in parent/child competitions strengthens relationships. Each family member feels the rush of cheering for a sibling or child and sharing in their triumphs and pitfalls. Dancing by its very nature encourages parents and kiddos to get up off the couch and do something active. Dance class fosters stamina, perseverance and endurance. Even practice time at home counts as a calorie-burning, heart-helping activity. When children see their parents doing something active to stay healthy, you can bet there are healthy habits forming. How great is it for kids to see their parents making goals, then working toward them with vigor? "We all practice together and are at dance together," says Cleverly. "It is so fun to have this common interest in our family. Everyone in our family has something in common with one another." Adults who go to practice and work toward a future goal give their kids the gift of ambition and the belief that they, too, can do anything they put their mind to. Why every Irish dancer needs a chance to perform and compete. 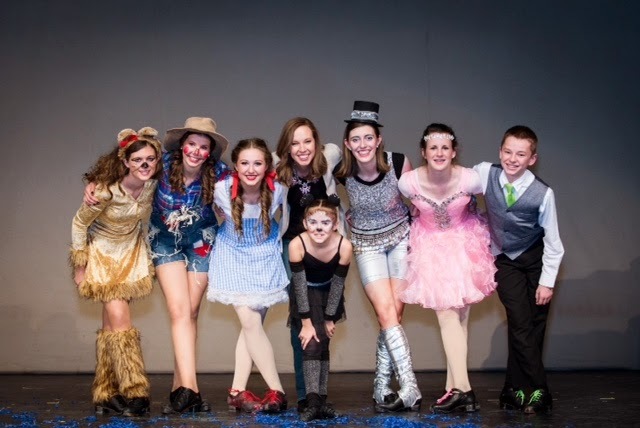 Legacy Irish Dance Company in the Wizard of Oz. Some dancers cringe at the thought of performing onstage, and others wouldn’t even think about competition. Both expressions of the art form have something in common—they are danced by people who love to Irish dance, and each of these avenues provide valuable experiences for both the dancers, and the dance schools they represent. Dance purely for the love of it. When you perform for an audience, no one is judging you, or telling you how to fix your technique. A chance to use your talents to serve others. Dance and music can bless the lives of those you perform for. It lightens their load, and takes them away from their problems for a little while. Performing strengthens the community and spreads culture. School unity. When younger dancers get a chance to perform alongside the older, more experienced dancers, a sense of belonging knits the school together. The younger set work hard with the hopes that they will be able to have one of the lead roles someday. Dancing for friends and family. When a school performs, the dancers are able to show their friends and family what they’ve been working on. Parents always appreciate a chance to see how the hard work and lessons are paying off, and everyone likes to see their dancer onstage. Pushing past limits. Preparing for a competition often gives a dancer the push needed to master what they’ve learned and dance better than they ever expected to. Focus. Competition dances hone a dancer’s skills and adrenaline, allowing them to focus intently the movement of their body to the music. Team spirit. Schools that travel together as a team and cheer each other on find a bond that is rarely found elsewhere. Friendships born out of competition are likely to last a lifetime. Travel. 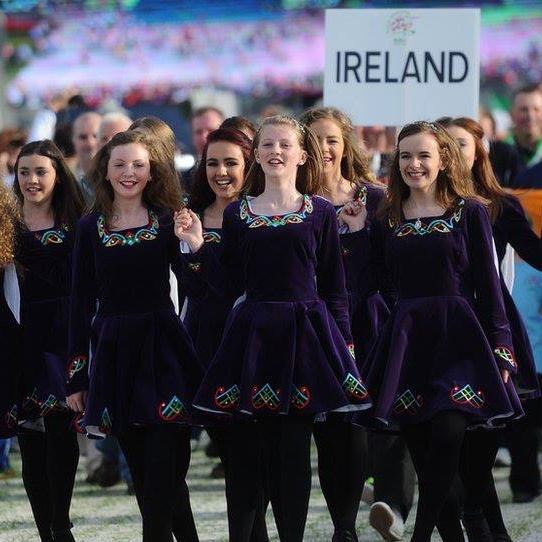 There are Irish dance competitions all over the world, and those who are lucky enough to travel widely to compete have the added bonus of going to places they otherwise would never visit. Irish dance community. Competitive Irish dance is a part of a world-wide community of dancers who carry on traditions and pave the way for future generations of dancers.